BraceAbility's open patella neoprene knee support was designed to protect your knee from future injuries, alleviate knee pain, and provide comfortable support to your knees. - Insert your foot into the largest end of the knee sleeve. - Continue pulling up until there is approximately 6" of material above your kneecap. - Material: The latex-free, 13" tall and 3/16" thick premium-grade neoprene material provides warmth and moderate compression to your sore knee, which reduces swelling and encourages blood flow to speed up your healing process. - Water-resistant: Similar to the wetsuits scuba divers wear, this open patella knee sleeve has waterproof qualities, making it perfect for swimming. If you do wear this knee sleeve when you are sweating profusely, showering, or for a swim, hand wash with mild soap and lay flat to dry out completely before using it again for running, cycling, swimming, surfing, etc. - Open patella and open popliteal design: This open front/back neoprene knee sleeve is a more breathable option and stays put without bunching, giving your knees the support they really need. - Sizes up to 4XL: With sizes from XS all the way up to 4XL, anyone from kids and teens to adults can wear this knee sleeve. Our larger sizes will even fit plus size or overweight men and women. HOW TO CHOOSE YOUR SIZE: Using a soft / flexible tape measure, find the circumference 6 inches above the middle of your kneecap and 6 inches below the middle of your kneecap - refer to the 2nd image above to choose your size. 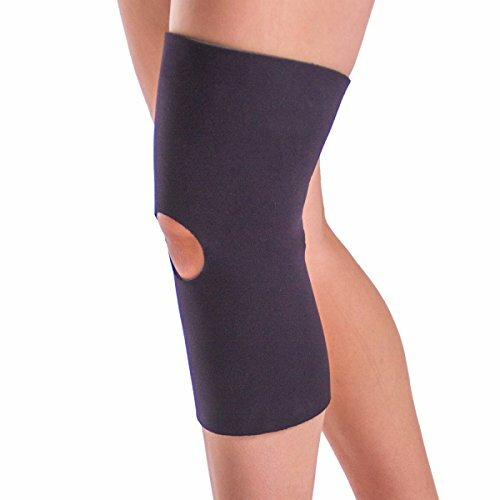 Hassle-free knee sleeve helps ease knee pain caused by arthritis, osteoarthritis, sprains, strains, patellofemoral pain syndrome, runner's knee, and more. Great for both athletes and non-athletes alike. Made out of premium-grade neoprene, making it durable, flexible, and water-resistant. The open front and open back design of this neoprene knee brace provides you with all day comfort and support. Knee sleeve is 13" long and 3/16" thick, making it flat enough to fit under ordinary pants, such as jeans, but still thick enough to provide adequate compression and support.